The annual Pandarpur Yatra carrying Jnaneshwar Palkhi from Alandi, near Pune, to Pandharpur Vithoba Temple is attended by millions of devotees. In 2019, the date of Sri Dnyaneshwar Palki Sohala Prasthan from Alandi is on June 25. Ashadi Ekadasi is on July 12, 2019. 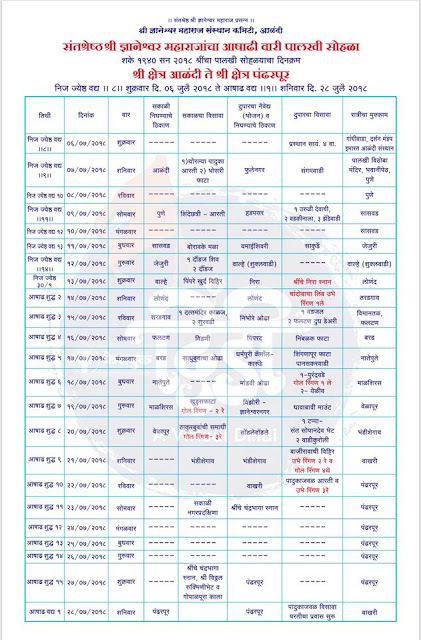 The schedule of Palki in Pune is given below. Considered to be one of the world’s largest pilgrimages, the waarkaris (Pilgrims) from Alandi follow the palanquin carrying the silver images of the Padukas (Sandals) of Saint Dnyaneshwar. The pilgrimage known as Waari in Marathi ends on the Ashadi Ekadasi. Sant Dnyaneshwar, also known as Jnanadev or Jnaneshwar revolutionized Marathi bhakti literature and at the age of fifteen wrote Jnaneswari – a commentary on the Bhagavad Gita which has been a household text in Maharashtrian homes for centuries. Lord Vithoba is an incarnation of Lord Vishnu and is worshipped mainly in Maharashtra and in some parts of Karnataka and Andhra Pradesh. The most important shrine of Lord Vithoba is located in Pandarpur near Solapur in Southern Maharashtra. 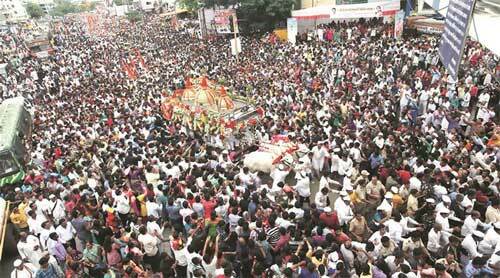 Another important Palki that is followed by thousands devotees is that of Sant Tukaram from Dehu near Pune. Dnyaneshwar Palki Sohala is from June 25, 2019 (commencement date). Both the Palkhis of Sant Tukaram Maharaj and Sant Jnaneshwar Maharaj meet on June 26, 2019 at Wakedewadi near Pune and jointly heads towards Pune city. Sant Dnyaneshwar Maharak palkhi will halt at Palkhi Vithoba Temple in Bhavani Peth. (June 26, 2019). It will stay in the city on June 27, 2019. It will head towards Hadapsar on June 28, 2019 and leave the city. It must be noted that today nearly 40 Palkis of various saints and Gurus reach Pandarpur to participate in Ashadi Ekadasi rituals.